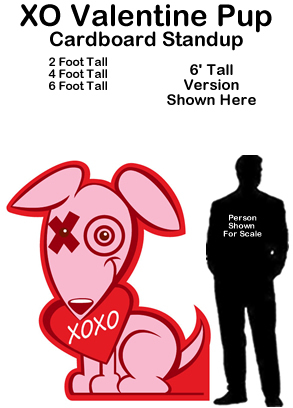 Valentine Sucker 1 Cardboard Cutout Standup Prop - Self Standing - Dino Rentos Studios, INC. 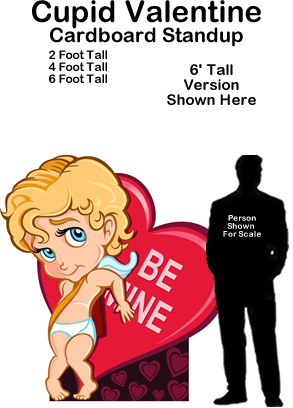 These are awesome Valentine-themed cardboard cutout props! Each 6' standup prop comes with a commercial grade cardboard tube and a base to make each self stand. 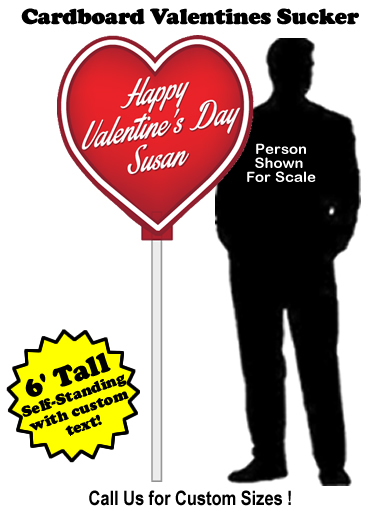 Placing these around your event will add some "POP"! Choose the recipient of your "Happy Valentine's Day" message with one custom line of text (included)! Order yours with a "High Gloss Vinyl" print or select "Economy Version" which is printed directly on cardboard. If you need them super sturdy, select plastic cardboard. Assembles in a few minutes. Manufacturing time is 5 business days. Want it sooner? Upgrade to Next Day Manufacturing. Select expedited shipping for faster delivery!